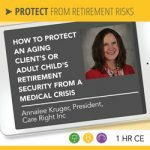 Annalee Kruger, President, Owner, and Founder of Care Right Inc., is a senior care advisor and caregiver advocate who assists families in navigating the complexities associated with the aging process. Annalee Kruger’s passion is to help families be pro-active and put plans in place before a medical crisis occurs. Annalee credits her compassion, empathy and in-depth understanding of senior issues to what she witnessed as her parents transitioned from adult children to caregivers of their own parents. Today, Annalee is entering the role of long-distance caregiver to her own parents, and as a result, she understands firsthand, the stress associated with the role. Annalee has spent her entire 25+ year career in the senior care industry and has become a nationally recognized expert in the field of senior care planning having presented at a number of healthcare, senior housing, and financial conferences as well as hosting dozens of webinars. While she serves families in SW Florida, she also serves families across the US. Gone are the days of families living in the same zip code, let alone time zone. Annalee helps families with her virtual guidance service and virtual family meetings and family coaching/education. Annalee has worked at every level in the long-term care industry, starting as a social worker over 25 years ago and eventually directing all operations of a community-based continuum of care retirement facility. In addition to Care Right Inc., Annalee has also founded Care Right U which provides specialized training and consulting to caregivers in corporate settings (i.e. home health care providers, senior living facilities). She is also the co-founder of Plan4Life which educates, via its Elder Planning Specialist Program, members of the financial planning industry on the unique skills needed to manage their clients as they get older. Most parents want to age in place, so a medical crisis can put families into a tailspin if a plan is not in place ahead of time. Adult children who assume the role of caregiver must re-organize their business and personal lives to meet the needs of an aging loved one, as well as find funds to meet the unexpected health costs. It is important for advisors to understand the needs typically associated with a medical event of an aging loved one, how it might affect the retirement security of the aging client and their adult children caregivers, and what can be done to help clients be financially and legally prepared. Annalee has worked with thousands of facility residents, their families, and caregivers as well as numerous health care agencies, and delivered hundreds of trainings and in-services to professionals and family caregivers on a variety of topics. Annalee has also provided business training for organizations across the US and China. 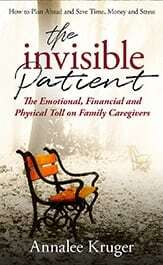 In 2018, Annalee published her first book, The Invisible Patient which outlines the emotional, physical and financial toll experienced by family caregivers. Annalee teaches caretakers how to appreciate the blessings of being a caregiver while also looking after themselves. It is not a luxury for caregivers to practice strong self-care — it is a necessity. The ability to be resilient, of knowing and sharing boundaries, and how to say “no” are vital for both the well-being of the caregiver and the caregiver’s patients. The Invisible Patient provides inspiration, encouragement, and guidance for finding ease and help during the caregiving journey. Annalee Kruger earned a BS in Social Work from the University of Northern Iowa and her MBA from Cardinal Stritch University in Wisconsin. In addition to being a Licensed Social Worker (LBSW), Annalee is a certified Family Mediator with further certificates in Greif, Trauma & Loss as well as PTSD Counseling. Annalee has served as an adjunct faculty member in the Human Services and Organizational Development departments at the University of Wisconsin – Milwaukee where she also received her Six Sigma Black Belt certification in lean process improvement. She has certificates in family mediation; and PTSD, grief, trauma, and loss counseling, and is currently in the process of earning her Certified Senior Advisor certificate from the Society of Certified Senior Advisors. She is a member of the National Speaker’s Association, National Association of Social Workers, and a sponsor of the Financial Planners Association in Wisconsin and Florida. How can you schedule Annalee Kruger to speak at your event? Annalee Kruger is an experienced speaker and presenter with a passion for providing industry-leading information to audiences. She is available to speak at your retirement meeting, conference or event. Inquire here about having Annalee Kruger speak at your conference or event!